Special performance of “29 Years For 13 Seconds: The Injustices of Justice”, sponsored by Interfaith CommUNITY Spiritual Center and Death Penalty Alternatives of Arizona. At 16 years old, Vance “Duke” Webster witnessed two friends commit a crime. When refused to “snitch” he was sentenced to life in prison. 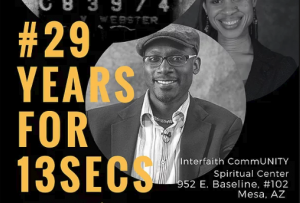 A one-act play based on a true story, “29 Years For 13 Seconds” is less about Webster’s time in prison and more about how women, religion and social services have created wild waves that he rides without the slightest hint of resentment. Don’t believe it? Come check it out. One night only, 7 p.m., Friday, January 19, 2018, 952 E. Baseline Rd, #102, Mesa, AZ. Help end the death penalty in Arizona with a tax-exempt donation. Please go to our easy online donation form by clicking the button below.